"This is Halloween, everybody make a scene!" Tim Burton's Nightmare Before Christmas introduces you to Jack Skellington, affectionately known as Bone Daddy. He is the discontented Pumpkin King of Halloweentown who, after wandering the forest, finds himself standing at the entrance of Christmastown. After a visit to Christmastown, Jack becomes obsessed with Christmas, but fails to understand it's meaning. When he tries to explain Christmas town to the ghosts, ghouls and goblins back home, Jack unwittingly becomes involved in a plan to take over Christmastown. Sally, a doll brought to life by the local mad scientist, has a bad feeling about the plan. With the help of some soup laced with Deadly Nightshade, she sneaks out the castle to warn Jack, but he does not listen. Her attraction to him continues to grow, as does her bad feeling about the plan. On Jack's orders, Santa Claus is kidnapped by Lock, Shock and Barrel, a band of children from Halloweentown. Unbeknownst to Jack, Santa Claus ends up in the evil hands of the frightening Oogey Boogey, where his life is at stake in a not-so-fun game of chance. As Jack dons the Santa outfit and takes flight in his coffin sleigh, led by skeletal reindeer and his dog Zero, Sally creates a fog to make it hard for Jack to take over Christmas. Zero's nose lights the way through the fog and Jack continues with his plan, delivering shrunken heads and other grisly gifts to the children of Christmastowmn. Sally, in yet another attempt to help the misguided Pumpkin King, attempts to free Santa, but ends up caught by Oogey Boogey. Soon, the town realizes that Jack is an imposter and the military shoots him from the sky. Halloweentown presumes that he is dead. Still alive, but with a failed plan, the Pumpkin King becomes depressed. After a bout of sadness, he perks up with new ideas for the next Halloween. Arriving home, he discovers that Oogey Boogey has both Santa Claus and Sally. Furious, he rescues them, then deals with Oogey Boogey, who literally comes apart at the seams. Santa confronts Jack for nearly ruining Christmas before rushing off to deliver gifts and toys to the children of Christmastown, thus saving Christmas. Before he leaves, he causes snow to fall on Halloweentown. The townspeople are confused but soon begin to play and enjoy the snow. With new ideas for Halloween and Christmas saved, Jack realizes all that Sally tried to do for him and is moved. They share a kiss underneath the full moon and Jack's discontentment is no more. 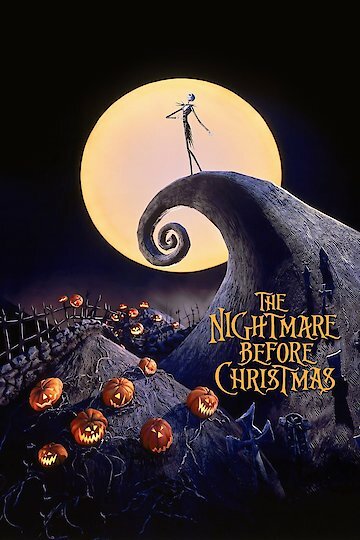 The Nightmare Before Christmas is currently available to watch and stream, buy on demand at Amazon, Vudu, Google Play, FandangoNow, iTunes, YouTube VOD online.